A region on the move – that’s North Wales and is rapidly growing as a destination. The information provided on this website is aimed at the Travel Trade and Business Tourism sectors including tour operators, travel agents, special interest groups, coach operators and conference organisers. You might be surprised, but we’re really easy to get to from anywhere in Britain. Just over an hour from Manchester, and four from London. With 3 designated Areas of Outstanding Natural Beauty in North Wales and 1 National Parks, North Wales is the perfect place to switch off and explore. 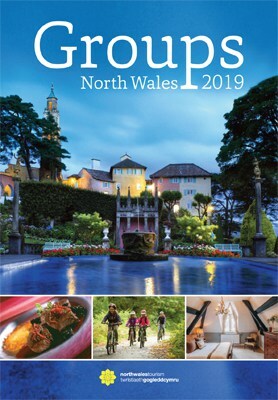 North Wales makes a big impression on visitors with its spectacular views and unparalleled beauty, with its range of diverse attractions, good quality hotels, conference and meeting venues and of course a warm Welsh welcome – we have it all here in North Wales. To the west lies Snowdon, the highest peak in England and Wales which dominates a rocky mass of mountains. Visit an island by crossing one of the two historical bridges over the Menai Strait to Ynys Môn, the Isle of Anglesey – with its 125 miles of coastline, a paradise of wild flowers and birdlife – not to mention all types of watersports. To the east, in contrast you will experience a gentler landscape of heather moorlands, green vales and the rolling hill of Wales’ Border Counties. Here you can visit one of the many interesting market towns, walk the hills of the Clwydian Range and quiet forest trails or soak up the atmosphere of historic stately homes and gardens. Or why not visit the North Wales Coast – a Welsh Riviera of contrast and charm with its Queen of Welsh Resorts, Llandudno with its superb setting, unique Victorian Charm and extensive range of accommodation. North Wales is small enough to explore, yet varied enough to visit again and again.